When Pharaoh Amenhotep IV succeeded his dad Amenhotep III to the throne, he instituted numerous far-reaching practices that shook up all of Egypt. First he changed his name to Akhenaten, or "Sun Buddy," and mandated the wearing of sunglasses by all adults, day and night. Then he revised the entire man-god theocracy, tossing out the numerous "pyramid heads" that had been worshipped for centuries and replacing them with a single deity, Amon Re, the "All-Powerful Almond." (Egyptologists, however, have since retranslated the name as the all-powerful allemande, which was a dance craze sweeping the Nile River Delta at the time.) Akhenaten also tried to change the name of Egypt to Ood-nan-tunk, or "lousy place to breed whales," but his queen, Nefertiti, mocked him so unmercifully that he soon annulled the name change. Nefertiti, too, was a major departure from consorts of the recent past who took pains to exhibit their dowdiness, for she was a genuine hottie. Hundreds of hieroglyphics still exist that portray her in various stages of undress, and the great Hieroglyph at Thebes shows her engaged in a precursor of the lap dance. Her sexuality was not lost on Akhenaten, to whom she bore six daughters and ninety-one sons before her handmaiden gave her a chastity belt for her thirty-first birthday. Nefertiti also supposedly had a hand in convincing Akhenaten to completely change the status of musicians in the 14th century BC. Before his reign, string septets, polka bands and funerary orchestras flourished throughout the empire. Composers were treated with dignity and were granted monthly stipends to churn out new tunes, which were invariably performed in front of responsive audients. The Temple Frieze of Hatshepsut at Deir el-Bahri depicts dozens of musicians being attended to by pulchritudinous groupies who apparently would do anything for a little sonata-allegro form, if you get my drift. The mummified remains of a jazz trio was unearthed at the Pavilion at Karnak where they had been buried along with Algonquin I, in effect bestowing upon them a rank commensurate with pharaoh. Franksinatria, a famous performer of the 18th dynasty, was accorded the status of demigod. But Akhenaten summarily put an end to all of this, as he saw it, competitive idolatry. One night in late 1375 BC, thousands of musicians, composers, instrument makers and impresarios suddenly went missing. They vanished without a trace; some even dematerialized in front of startled spectators. Of course, Pharaoh was immediately suspected as the cause of their disappearance, but few people actually pointed fingers at him, for fear of losing those fingers as well as the bodies attached to them. Akhenaten's official explanation was that they had been seized by a flock of giant crows and taken to Nubia, a rival empire to the south. Then, before other musicians could fill the void left by their mentors, Pharaoh issued a proclamation that redefined what constituted acceptable music. It favorably compared the richness of Egypt's contemporary music to the Ramses Blintzes so popular in the food courts. Nevertheless, the music also tended to give Amon Re a terrible headache. And, as god, he had the right to a little peace and quiet when on the mortal plane. So, henceforth, the only permissible combination of melody, harmony, rhythm and timbre would be la musique de l'amande--almond music. No one knew what almond music was supposed to sound like and Akhenaten wasn't telling. Composers, naturally, experimented with sounds that, to them, represented the familiar indigenous tree. The tree's pink flowers became a hot topic for art songs. Fertilization of the fruit was a leitmotiv in numerous operas. But no composer or sound designer who presented a new work to the Almond Tribunal--another dictate of Pharaoh's proclamation--ever reappeared, at least with his ability to speak intact. Gradually, the art of composing lost its luster, at least to those who also enjoyed blintzes, and Egypt deteriorated into a land of silence. As the years passed, the behavior of Akhenaten became even more bizarre. He glued hundreds of almond kernels to his body, redesigned his sedan chair to resemble a giant almond, and decreed that the Great Pyramid of Giza be painted a pale, almondy tan. Because the blue and fuchsia hues with which the pyramid was originally covered were so brilliant, the task took nearly three decades. By now, even Nefertiti was beginning to give her husband a wide berth. Akhenaten died in 1362 BC, supposedly of natural causes, however a recently discovered frieze in his tomb contains a hieroglyph of a group of composers stoning him with what look like giant almonds. At any rate, immediately after his death, his predecessors, Smenkhkare and Tutankhamen, reestablished polytheism and, more importantly, music that would soon again rival the fabulous Ramses Blintzes in richness. 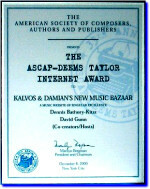 Today's 422nd episode of Kalvos & Damian's New Music Bazaar employs music whose richness is measured neither by blintzes nor almonds, but rather by an in-person composer who will hopefully explain why he, too, wants to change his name to Ood-nan-tunk. But first, a few fundamentally funereal phrases from Kalvos.